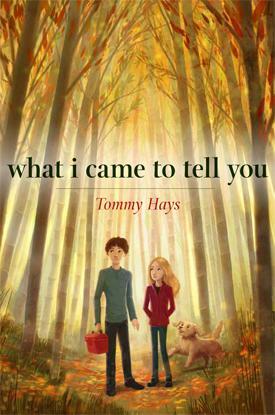 What I Came to Tell You, Tommy Hays’ latest novel, is a 2014 VOYA Top Shelf Pick for Fiction for Middle School Readers and a 2015-16 Nominee for the North Carolina Young Adult Award. Written for readers from ages 10 to 100, What I Came to Tell You was a Fall 2013 Okra Pick by the Southern Independent Booksellers Alliance (SIBA) and selected for the American Booksellers Association’s 2014 ABC Best Books for Children Catalog. To read an excerpt from What I Came to Tell You, click here. Check out Tommy's guest post for Write All the Words! in honor of Banned Books Month: "On Trial in the Library." Read a recent interview with Tommy by Kids & Books Editor Kathy Stewart for NoveList. Click here to read a thoughtful review and interview with Tommy on the sensational blog Smack Dab in the Middle, by the writer Sheila O'Connor. Hear Tommy in conversation about What I Came to Tell You and his career in an interview on Walter Edgar's Journal, recently broadcast on ETV Radio South Carolina. Listen to Tommy talk about What I Came to Tell You in a recent interview with Greta Johnsen on WCQS. Tommy Hays is executive director of the Great Smokies Writing Program at UNCA, which publishes The Great Smokies Review. When I began writing What I Came to Tell You, I was describing Grover, my main character, to my brother, an architect. I told him how Grover spent much of his time in the Bamboo Forest close by his house and how he made tapestries out of bamboo and leaves. My brother said it reminded him of Andy Goldsworthy, who I had never heard of. I looked him up and discovered that he’s a famous English artist who has made a career out of working with natural objects in the natural world. Goldsworthy uses all sorts of materials such as snow, ice, leaves, bark, rock, clay, stones, feathers, petals and twigs to create spectacular outdoor sculptures, usually on the very spot he finds the materials. The more I researched Goldsworthy, the more I felt I understood Grover and his impulse to create these remarkable tapestries in the Bamboo Forest. Goldsworthy says, “I cannot explain the importance to me of being part of the place, its seasons and changes.” Grover certainly feels that connection very deeply with the Bamboo Forest. And as a writer, I feel that way very strongly, that my characters have to be immersed in place, which, in this case, is Asheville, North Carolina.